TURN IT AROUND overwhelmed me. 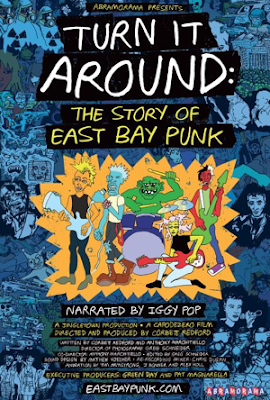 Its nearly three hour long recounting of the punk scene in the East Bay near San Francisco is so chock full of information I thought my brain was going to explode. A film that touches the head, the heart and the ear the film nicely lays out the movement that gave us Green Day and other bands. Striving to tell us everything there is to know about the East Bay punk scene Turn It Around gives us the whole story from the 1970s when the music of the Ramones shook up everyone’s idea of what music could be. The film then tears through decades of history to bring us to the present day. It is a film full of music and images from the time as we hear the stories from those who survived the march of time and listen to the music of bands who shaped the music we listen to today despite only lasting, in many cases for a very brief time. This is a film that beautifully lays out the punk movement in Northern California. It’s a film that kept me up until 2 am watching it’s tale spin out as crazy stories were being told and some glorious music was playing. For those who are interested this is a super film that will fill in all sorts of holes in your education. But as good as it is it is not without problems. The first problem is the films length is a tad unwieldy. Clocking in at two hours and thirty seven minutes the film makes a game try to tell you everything that you wanted to know about the punk scene in one sitting. It’s a one stop shop approach is commendable but as we close in to two hours it becomes almost too much without a break. In a weird way had this gone a tad longer this could have been a great PBS 2 night event. The next issue is the film doesn’t completely give us a context for what we are seeing. There is a lot of discussion of the places of the East Bay but there isn’t enough of an attempt to explain it to people who have never been there. Yes they roughly give us city or neighborhood locations but actual club venues not so muc. Additionally people and events are mentioned as if they would mean something, but it always isn't clear who they are what things were. The lack of context makes this a tough film to recommend to anyone who doesn’t know the East Bay. The probably my biggest problem is the scene is made to seem as though it is happening in a vacuum. There is only fleeting mentions of outside influences or the outside world. Where did the drive to make this music come from? What were they listening to before? The Ramones are named checked but other than a reference to the European punk scene, the only reference is to punk fashion. What were these kids listening to? We don’t know. As far as we know the music spontaneously appeared in the ears of the musicians. Reservations aside this is a killer film. I am nit picking becase this film is so damn close to being perfect I'm annoyed it isn't. In all honesty despite making notes about my uncertainty with parts, as soon as the film was done (and even before) I was emailing and texting my friends to tell them they had to either see TURN IT AROUND and/or if possible cover it. There is something about the emotion and wealth of information contained within it that trumps any quibbles that I have. Recommended for anyone with interest in punk or the history of rock and roll.